I only just discovered the blog 'indexed', via Time's blog index, and it's pretty awesome. 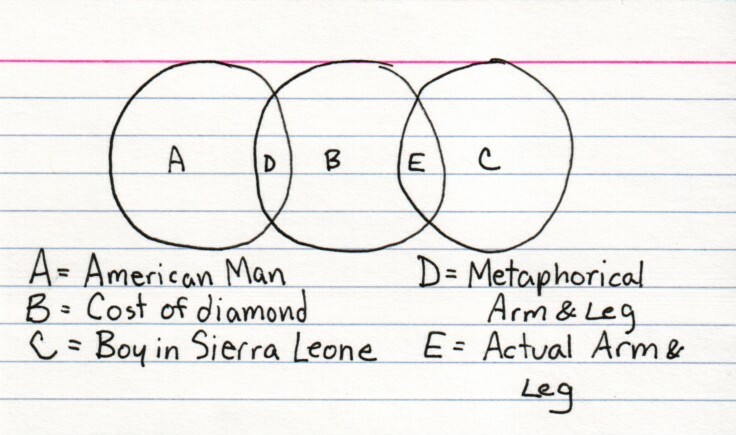 It's a ton of little index cards, with simple Venn diagrams, graphs and charts forming little comments on life. They're cute and quick, and generally pretty funny or thought-provoking, and there's an absolute ton of them, so there should be some value to be got out of them. The only thing that annoys me about them so far, is the insistence of the artist in putting the dependent and independent variables on the axes seemingly randomly. 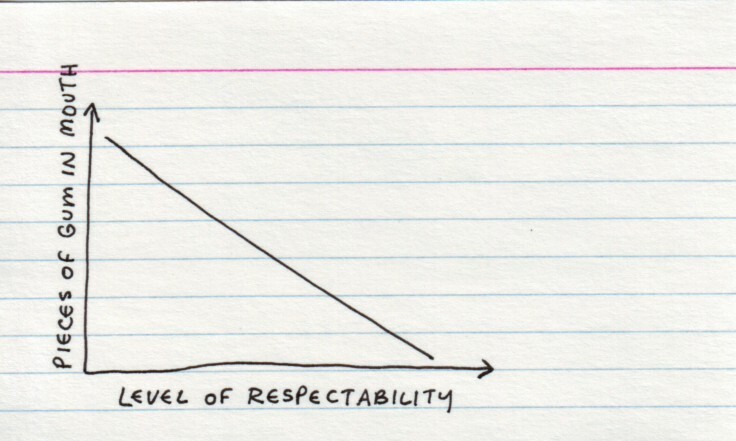 Maybe you really do mean that as respectability increases, gum-in-mouth decreases, but I think that it'd be more effective the other way around. And certainly easier to parse, mentally, on a first time read. It's a minor quibble, and for a casual glance every now and then, I've got a lot out of the blog. On a more serious note, letting your daughter die by preferring prayer to medicine is not actually abuse. And the parents have three more kids anyway, so I guess not a huge loss for anyone, huh. An interesting analysis from a while back, of the chances of the Democratic candidates, and the difficulty of the task facing Hillary, despite the seeming closeness of the race. Some more awesome analysis on gender inequality in popular movies, from the infrequently updated, but always genuinely interesting and informative xkcd blog. And finally, I've been sucked back into the delicious but time-consuming world of Warhammer, and while I'm currently resisting the time-sink that is the actual collecting-and-painting side of it (concentrating at the moment on just playing with other people's models), I have also been examining with fear and awe some of the larger models. Ahh the Great Unclean One, one of the most disgusting bags of crap ever to be modelled in plastic. Love it. I shall have to make sure I get some gaming with you when I'm situated more closely to you.